Walks: for a route to the summit from the SW, see Whilde & Simms, New Irish Walk Guide - West and North, 54-55. Bunnacunneen is the 347th highest place in Ireland. Bunnacunneen is a well located peak situated across the R336 to the north and east of the Maamturks range; It has a full 360 degree views from its summit. 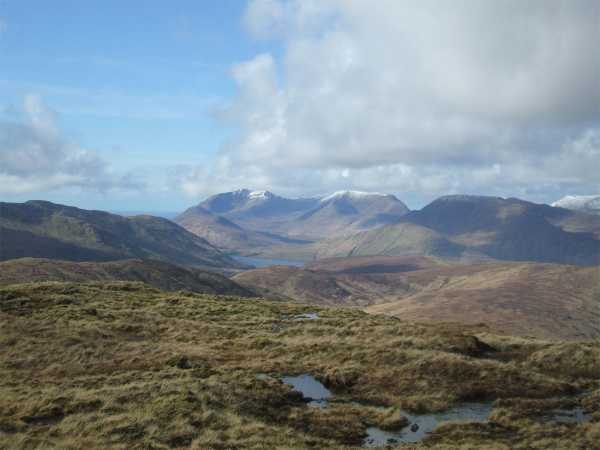 The views are stunning on a good day, taking in the whole range of the Maamturks, Ben Gorm, Mweelrea, Devil’s Mother, Maumtrasna and the Sheefry Hills, as well as Croagh Patrick and the Nephion Beg range. The peak can be approached in a number of ways. 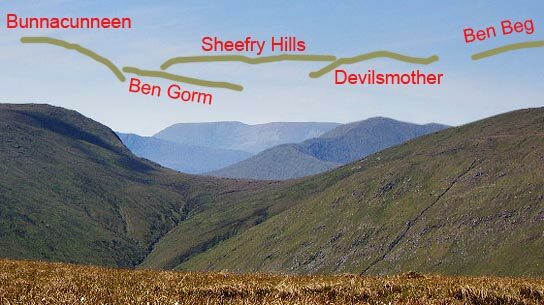 For a quick ascent of Bunnacunneen by itself, the most obvious routes are from the west, parking along the minor road and following the south western spur, or the river valley itself which leads almost to the summit. Another is from the Drishaghaun Valley; parking is difficult in the valley, but there are a couple of places at L97196 56996 A, and also at L9782 5684 B. From the first of these, cross the fence and contour west with a touch of north before reaching a river gully. Follow this gully northwest, contour around point 542 and head west to Ben Beg. Over Ben Beg head west; there is a descent of 140m before the pull up to Bunnacunneen. 1.45 hours should see you at the top. Picture from simon3 : Bunnacunneen and summits north of it. Picture: Bunnacunneen and summits north of it. Why would you go up Bunnacunneen? True at 575m it isn't so high and true it is has hardly the same grand slopes as many of the surrounding ranges. However on a good day it has a full 360 degrees of view from the summit. The whole range of the Turks from Corcog to Leenane Hill, the flanks of Maumtrasna, Rinavore, Ben Gorm, the Devil's Mother and Mweelrea and then to the east there is Lough Mask. On the day we summitted there was a clear view of the Sheefrys, Croagh Patrick and some of the Nephin Begs which are 45km away. Include Ben Beg and Lugnabricka and you'll have a great circuit. I started the Drishaghaun circuit at the only place where easy parking can be had , at point L972570 E. Taking the concrete road up to a large, modern farm building, then through a small gate to the right of this and through two more fields and over the first of many wire fences to reach the mountain proper. A relatively easy ascent can be made along the left hand side of the stream, which was a mere trickle on account of the prolonged dry summer of 2014. The summit of Ben Beg is soon reached and marked only by a forlorn collection of small stones. The descent into the gap below Bunnacunneen (does any other Irish mountain have five of the same letter in its name?) and subsequent climb continues along the line of fence posts. The old wire can be seen in places, coiled and discarded to rust for eternity. The remainder of the circuit is relatively easy with small undulations and superb views out to Lough Mask to the east and Maumturks to the south and west. What can't go unsaid is the staggering amount of fencing that covers almost the entire 13km circuit of these hills. The descent from the Lugnabricks takes you over no fewer than six wire fences if you take a direct line back to the start ,though you must avoid the cliffs to the north of the summit by heading east for 500m first. In one place there is a solid dry stone wall with two rows of barbed wire on top, which would not be out of place in a prison. All the money that has been spent erecting wire fences around here would be enough to build a children's hospital.